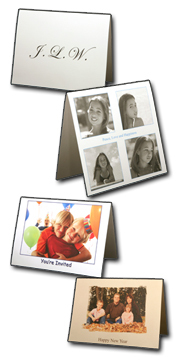 Save on time while adding that personal touch with custom cards! Choose from a variery of fun and festive photo cards or a selection of classy wedding and special event invitation designs. You can create elegant custom folded greeting cards on different paper stocks, including Linen and Watercolor paper. You can have text on the front and inside the folded card, (view font selection) including photos or other images on the inside of the card, and even a collage of photos on the front of the card. Perfect for holiday greetings, engagement or wedding announcements! 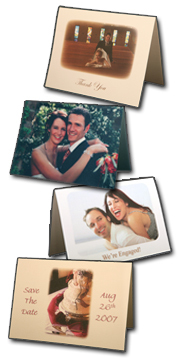 Come in and see our exciting new line of trifold and door-folded custom cards. - general turnaround time of same or next day and service with a smile! e.g. removal of stray hair, blemishes, color correction, etc.